A few thoughts on the Stoke RFC 1-1 Arsenal league match | "It's all about the Arsenal"
Stoke start the game with a couple of fouls to let Arsenal know they are there and Whitehead picks up a yellow card, but only after RVP intervenes. Then Yossi is put in by RVP and his shot is saved by Begovic low down. Good work by Ramsey-RVP-Gibbs who taps it to TR7, he crosses and there is RVP to head the ball on target only for Begovic to make a good save at the near post. Corner Arsenal. Nothing comes of it, but Stoke go up the other end and a cross from Ehterington find the Shard of Glass and he just has to stand their to out jumps TV5 and head the ball past S13 to put the cavemen 1-0 up. Arsenal come back and grab a corner, which again comes to nothing. Then Arron tries his luck but the shot goes past the post. TV5 plays a long passes the ducthie up the left hand side and Benayoun wins a the battle with Stotton, plays in TR7 with a reverse pass. TR7 has a little glance up and crosses a pearler of a cross right onto RVP’s right boot and it’s 1-1 with the ball into the left hand corner of the net. No more than Arsenal deserve. He scores when he wants is back and goes 2 up on Rooney. Another couple of chance for RVP and K6 the former having hos shot blocked and the latter header is too high. K6 then puts in Gervinho who shot is high, wide and handsome. Gerv needs to work on his finishing. Not much else to shout about as the games goes flat for the remainder of the half. Arsenal fans in good voice throughout the half. Early Arsenal pressure sees RVP again have his shot blocked and Gerv again go for the high, wide and handsome option. Sagna’s cross is then headed towards goal by RVP and Begovic saves. Tv5 then buys a tickets for the raffle to shoot and is also high, wide and handsome. Yossi is now booked for poor foul, but showing good fight against the enemy. Now Song goes into the book. 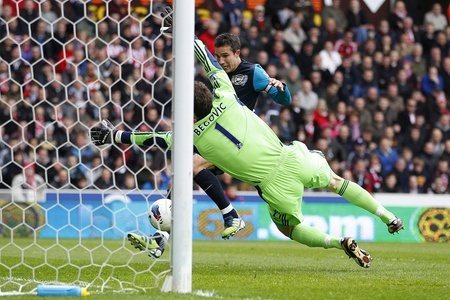 RVP and TV5 both have shots blocked as Stoke players prepared to throw themselves about to stop the ball going in. The thing here is that TV5’s pile driver was handballed by Shawcross and he arms were up and that’s a penalty for me…Ramsey turn now to shoot wide after being set up by TR7. Diaby replaces Ramsey who has played well. Another couple of corners for Arsenal that come to nothing, Arsenal are overall weak on corners. Santos comes on for Benayoun. Sagna has a pop at goal but saved easy by Begovic. TV5’s shot just goes wide of the right hand post. In the big scheme of things a good point at the Britannia where none of the big clubs have won this season. The team played with some fight in their bellies which is needed at grounds like the Britannia. The defence is getting stronger and not sure what you can do against a very good cross and a guy who is as tall as Crouch. K6 had another storming game by all accounts as did Sagna and Gibbs. Ramsey also had a good game I am hearing. The view I am getting in feedback though is TR7 is the man of the moment yet again, who was everywhere, and pushing us forward, ably assisted by Benayoun. Well done lads, pleased with result today. So a quick tally up and the remainder of the season pans out something like this, should we win against Norwich next week. Newcastle… Arsenal beat Norwich and Newcastle have to get 7pts from their remaining three games, however, due to GD they would have to win all their matches to overtake Arsenal. Tottenham… Arsenal would be 10 pts in front of Spuds meaning with GD Spuds they would have to win all four games. to overtake Arsenal, unless they could better the minimum +7 GD Arsenal would have by beating Norwich in their remaining four games. Currently GD is +6 on Spuds +6 on Chelsea and +17 on Barcodes. Of course if Chelsea were to draw v Newcastle then Newcastle could get a max of 69 pts and Chelsea could get a max of 68 pts… We beat Norwich and we’re on 69 pts… Spurs can get max of 71. Arsenal max is 72 . Finally Stoke fans. Why are they booing Arron Ramsey, they have some real poor fans behind them and the club should do something about it. I must say seeing the Stoke fans taking the mickey out Arsene at the end was quite funny, ala Old Trafford when he was sent to the stands, nothing wrong with a bit of humour, the bird with the low-cut top seemed to be leading the charge. The thought it was the world record attempt to do “The Wenger” was also funny. However the booing of Ramsey is NOT!!! In an interview after match Arsene said. This was taken from a forum where a fellow named Toronto Gooner put it, thanks to him. Q. Asked about the penalty..
Q. Stoke spent more than 11 minutes on set pieces today, How do you feel about that? You are used to it. They have a relationship with me but I don’t have one with them. (Laughter all around). I personally have enough experience to cope with that [abuse from the crowd] and it doesn’t bother me too much. I don’t listen to what people chant and I just think that one day football will have to tackle that because it’s easy to sit in the stand and insult people, you know I don’t know what they chanted and I’m not responsible. Everybody in life is responsible for what they say and what they do. My response is that I ignore what people say, and I focus on what I love in my job. It is football I love, and the way my players behave on the pitch [is what I’m responsible for]. I’m not responsible for the way people behave in the stands. If you want to stop that, it’s easy to stop – but I cannot influence it. It goes on so much in England, I’ve been here for 15 years [laughs] and I can tell you that basically I don’t here it. Q. How is it easy to stop if thousands of people are doing it? You can isolate every single face – you know the thing I think sometimes when I leave the pitch at the end of the game and people insult you or are angry or hateful I just think: I would like a little picture [of you] and I’d send it [to your] home and you show it to your son or your daughter and then we’ll see if you come back next week and do it again, see if they are proud of you. That’s all you can do. I have always been a great fan og Arsene Wenger, not just the manager, but the man. This interview says a lot about him and his morals and the lack of morals born into many people today both at games and on social networking who think abusing people is the thing to do. It’s so easy to just sit behind a PC, Laptop, Mobile device and let people have it.